Lewis Hamilton claimed victory at the Canadian Grand Prix on Sunday evening, while Sebastian Vettel lost his chance of victory following a poor strategic call and Nico Rosberg had to limit the damage following a first lap bump which sent him down the order. Hamilton led the Silver Arrows to a front row lock-out on Saturday as he searched for his fifth Canadian victory, but it was Sebastian Vettel who led the pack into the first corner on Sunday following a superb jump on the Mercedes into turn 1. As he watched Vettel steal his lead, Hamilton had to defend against team-mate Nico Rosberg who was eyeing up an overtake around the outside of turn 1. Hamilton understeered and bumped into Rosberg, sending the Championship leader off the track and across the run-off area where he rejoined in ninth place. It was to be a long afternoon for the German. Rosberg’s compatriot was comfortable in the lead as he maintained a 1.5s gap to second-placed Lewis. But when Jenson Button’s Honda engine gave up on lap 11 and a Virtual Safety Car was deployed, Ferrari took the ambitious move to bring in both Vettel and Raikkonen, putting them on a two stop strategy in contrast to Hamilton’s one-stopper. Hamilton inherited the lead and held a comfortable advantage over the Red Bulls of Max Verstappen and Daniel Ricciardo, but Vettel was fast charging on the newer tyres and, although encountering some expertly handled resistance from former team-mate Ricciardo, he soon gave both Red Bulls the slip and promoted himself to second. By lap 25 Hamilton’s tyres were exhausted and he had a Prancing Horse growing ever larger in his mirrors so he pitted for a set of the harder compound Pirellis. This gave Vettel his lead back while team-mate Kimi Raikkonen began backing up the drivers further down the road to allow Vettel some clear air to rejoin. He took his second and final pit stop on the fortieth lap which saw him rejoin with thirty laps left and only eight seconds between himself and Hamilton. But what should have been an easy gap to close proved much more difficult for Vettel as he got caught behind backmarkers while Hamilton increased his pace. He had only halved the difference over the next twenty laps, following which he cut the chicane not once or twice, but three times which cost him roughly a second and a half per slip. This ensured Hamilton was left unchallenged at the front of the grid, after a fantastically well-managed race from the three-time World Champion. Meanwhile, Rosberg looked poor for most of the race as he recovered only two positions from ninth place before the first stops. Although the end of the race brought a much different Nico who made short work of Daniel Ricciardo and Kimi Raikkonen – including a very impressive overtake into the final chicane on the Ferrari – he found his match when trying to pass Max Verstappen for fourth. He found out the hard way that Verstappen can be a fierce opponent, trying to replicate his overtake on Kimi he locked his rear tyres on entry and ended up sliding sideways into the run-off area. He was lucky not to beach his car or to have made a mistake a little later and clouted the barriers for he was able to rejoin the track without losing a position, finishing the race in fifth. Jolyon Palmer’s bad luck continued in Canada as, after ending his race following a slip on the paint of a Zebra crossing on the Monte Carlo street circuit two weeks ago, he met an early end in Montreal at the hands of a water leak. Massa became the third and final DNF when he too suffered a water issue which caused the temperature to rise, and so retired to protect his brand new power unit. The other Williams was celebrating a third place, the team’s first podium of the season. Bottas had a rather straightforward race and got everything right, which he post-race claimed demonstrated Williams’ ability to be a strong team who get good results. Just behind him in the standings is Max Verstappen who met his match in Monaco when two single-car crashes into the barriers, including a race DNF, robbed some of the bragging rights he’d acquired from his Spanish GP victory. This time around he was back to the Verstappen we know and love, the impressive racer and steely tough rival (see Rosberg) who kept cool and brought home a nice fourth placed finish for Red Bull, with Danny Ric in 7th. Kimi was perhaps less impressive as he was outshone once again by his younger team-mate. In typical Ferrari fashion, as one car impressed out the front, a second one lingered further behind. Raikkonen is the Massa to Vettel’s Alonso of the early 2010s Ferrari line-up and it remains to be seen if he will remain with Ferrari, or even in F1 (although I doubt he’ll race for anyone who isn’t the Scuderia) this time next year. I’d imagine Ferrari are far more interested in Kimi’s compatriot who joined Vettel and Hamilton on the podium. Haas once again showed they’re not backmarkers when they got caught up in a Fernando Alonso-led Trulli train in the earlier part of the race. The two finished in twelfth and thirteenth after a couple of nicely executed overtakes on each other, a strong result for a team who are only seven races into their Formula One career. Their early form shows their day may come in years to come, but for the moment our attention is focused on the Mercedes and Ferrari outfits, and particularly the rapidly shrinking gap Nico Rosberg holds at the top of the table. His 43 point lead entering the Monaco GP has, in typical Rosberg fashion, been annihilated by a resurgent Lewis Hamilton taking two wins from two. Although he probably has a Ferrari strategy mistake to thank for his Canadian win, and definitely has the Red Bull blunder of two weeks ago to thank for a Monaco victory, the most important thing is that he’s taken fifty points from two races. Rosberg seemed rattled in Monaco and less feisty than one could expect into turn 1 in Montreal. He showed at the end of the Canadian race that he has the pace to retain the Championship lead (eh.. lets gloss over his mistake he made when fighting Verstappen) so needs to make a firm comeback in the upcoming inaugural Baku GP. If he can’t make a stand next week then surely that’s goodbye on his (last?) chance of a World Championship, but I’m glad to see Vettel is now getting himself firmly into the mix, ensuring Hamilton has a fight on his hands to retain his title. 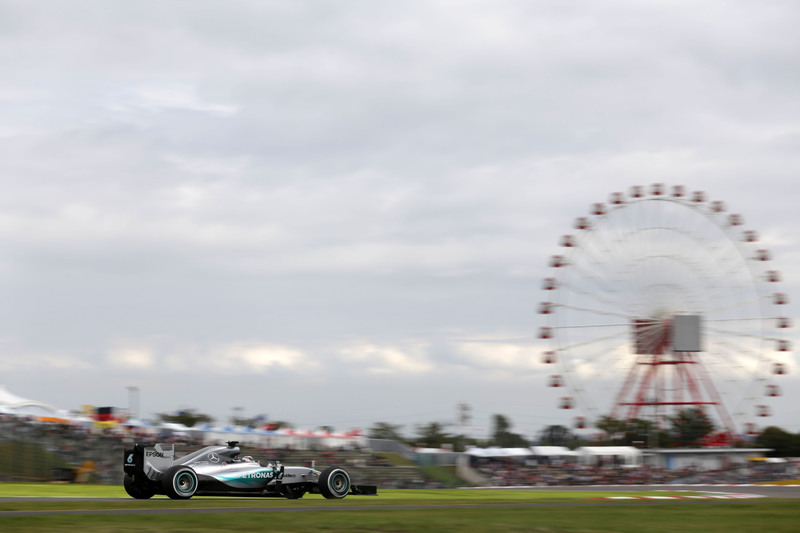 Lewis Hamilton eased to victory at the Japanese Grand Prix, overtaking his team-mate on the start and commanding the race for the remaining 53 laps. After falling several places into the first corners, Rosberg fought back to bring Mercedes a 1-2 finish, but has still lost another crucial 7 points on his team-mate, extending Hamilton’s lead in the Championship to 48 points. Rosberg had clinched pole on Saturday with Hamilton slotting in behind him to keep the pressure on. But at lights out, Hamilton had a slightly stronger start than the sister Silver Arrows which allowed him to pull alongside into T1. Rosberg’s efforts to snuff the overtake failed miserably as he spilled over the track limits and allowed the Ferrari of Vettel and the Williams of Bottas to slip past him and demote him from first to fourth in the first two corners. Behind them, Ricciardo had been squeezed and knocked into Felipe Massa’s front wing. The ensuing traffic saw Perez get hit and slide into the gravel at a vast rate of knots. Subsequently Massa and Ricciardo had to pit to repair their respective punctures, with Massa also taking on a new front wing. As Hamilton secured his lead with a new fastest lap helping extend the gap to second placed Vettel, Toro Rosso’s Carlos Sainz began the first of many mid-field squabbles when he slipped past his countryman Alonso, while Button seemed to be reversing as Nasr and Verstappen breezed past him on both sides into T1. Alonso made sure to radio his frustration at the “embarrassing, very embarrassing” ease with which he was passed – at engine developer Honda’s home race. 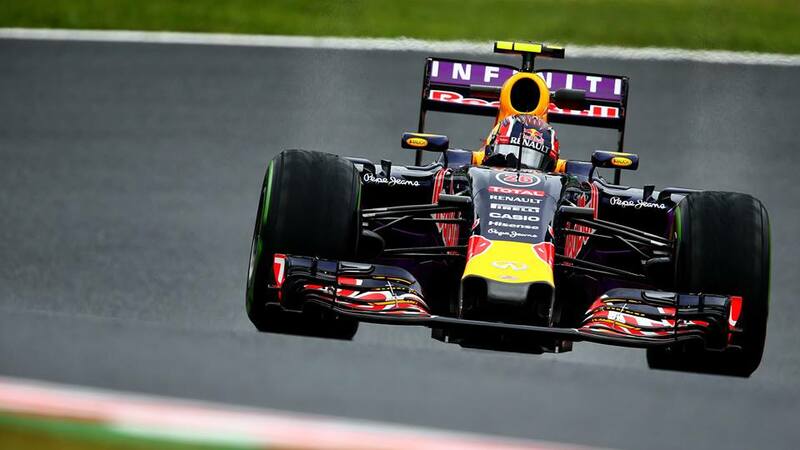 Nevertheless he managed to fight off the challenge presented by Daniil Kvyat’s Red Bull for ten laps. The young Russian himself had to fend off Verstappen at the same time and eventually dove into the pits, leaving the feisty Verstappen to challenge for Alonso’s tenth place. He, again, managed to hold the Toro Rosso off for several laps until a small error on the exit of the final corner allowed the 17-year-old to use DRS to pass the 34-year-old double World Champion. Ericsson repeated his practice spin at Spoon curve which allowed Grosjean and Nasr to get past him, while Vettel maintained his position over Bottas after the two had completed their first stops. Following his own pit stop Rosberg began to charge after the cars in front of him. His first target was Bottas who he caught with remarkable speed and made short work of the into the final chicane, diving down the inside of the Finn, who didn’t seem to be particularly expecting the move from far behind. At the same time, Verstappen was trying to make ballsy moves of his own and attempted a pass around the outside of Kvyat on the outside of 130R, although sensibly backed out of it when the Red Bull closed the door. Will Stevens showed the perils of taking 130R for granted later on in the race when he spun through the corner and narrowly avoided a huge impact with team-mate Alexander Rossi. Vettel ducked into the pits on lap 31, avoiding debris left by Sainz who hit a pitlane bollard and broke his front wing. The German was stationary for less than three seconds as he changed his Pirellis, but when he emerged the much faster Rosberg had successfully utilised the undercut to sweep past him and into second. With Hamilton over ten seconds away, and pulling out half-a-second per lap, Rosberg settled in to maintain his second place from Vettel. Further down the grid was less settled with everything left to fight for. Sainz scooped past Sergio Perez, Fernando Alonso (to another angry radio outburst and scream from the Spaniard) and then Jenson Button into 130R to grab the final spot. Verstappen followed his team-mate through the field and pulled a nice move on Sainz at the final chicane. Kvyat made a similar move, despite running with front-end issues which made his car unstable, on Ericsson on the penultimate lap. The penultimate lap also saw Felipe Nasr pull into the pits and clamber from his cockpit. With nearly twenty seconds in his pocket Hamilton proved unstoppable as he cruised flawlessly to his 41st Grand Prix victory. The tally puts him on par with his idol, Ayrton Senna, who ironically won his three World Championship titles at the same circuit. He has pushed his title lead to 48 points over Rosberg and with both drivers ringing up 43 points for Mercedes, a 1-2 at the next Grand Prix would seal another Constructor’s Championship for the team. 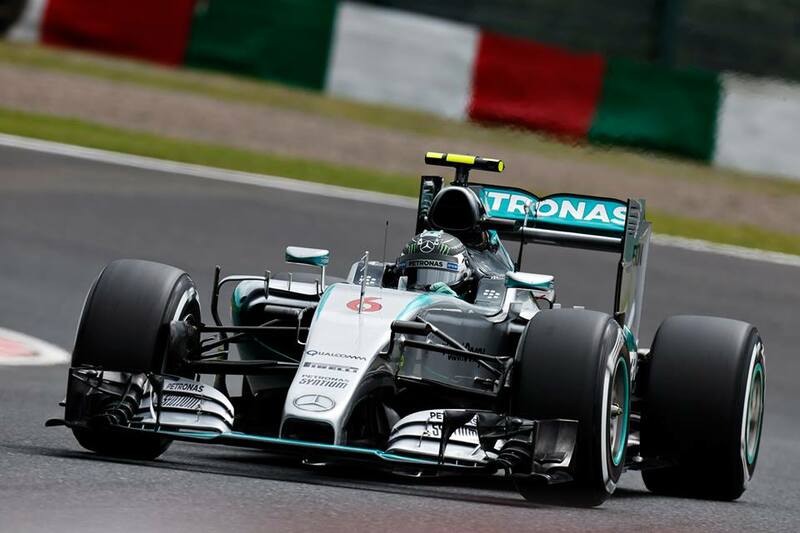 Nico Rosberg cemented Mercedes’ return to dominance when he grabbed pole at the Japanese Grand Prix on Saturday. The German had to fight off the challenge of his team-mate who edged closer every session, but an error on his timed lap in Q3 cost Hamilton and he settled for the second slot on the grid. Valtteri Bottas proved best-of-the-rest while Daniil Kvyat emerged unscathed from a mammoth crash. In an effort to make up for the lack of dry running, most of the drivers took to the track as the green light flashed at the beginning of Q1. Max Verstappen was the first driver to clock a lap, although his fast first and second sectors were somewhat tarnished when he slipped wide at the final chicane. The Mercedes duo of Hamilton and Rosberg jumped then to the top of the timesheets while the Williams cars and Daniel Ricciardo were some of the men separating the Silver Arrows from Verstappen’s Toro Rosso. Marcus Ericsson came close to clouting the barriers when he touched the astroturf on the lead into Spoon curve, with his C34 snapping and spinning into the gravel, leaving a startled Ericsson asking what had happened. His spin affected Marussia driver Alexander Rossi who couldn’t set a competitive lap with the yellow flags flying and so ducked into the pits. When he returned to the track at the end of the session to finally set a lap, Max Verstappen’s Toro Rosso ground to a halt just after the hairpin with what looked like a mechanical gremlin, which again impeded Rossi and left him without a lap time. It also affected Button who didn’t have the chance to improve on his time and got stuck in 16th – meaning he’d drop out of Quali at Q1. He blamed the team for not telling him which way to set his engine and subsequently setting the wrong engine map himself. It’s the first time in his career the Briton hasn’t qualified in the top ten at Suzuka. This benefitted team-mate Alonso, though, who narrowly scraped through to Q2. Q2 got underway and, although fast enough to progress into Q2, Verstappen was obviously out of contention and watched from the pitlane. Almost immediately, Rosberg dived to the top of the timesheets and was soon followed by Hamilton who went second fastest. The Williams men flanked the Silver Arrows but Kimi Raikkonen edged himself two-hundreths ahead of Massa, while Vettel occupied the other side of the Williams. The top six felt confident enough to sit out the rest of the session, leaving the remaining eight to battle it out for the last four places in Q3. Perez split the Red Bulls with the three men in the top ten, while a late lap from Alonso was not strong enough to make the top ten. Hulkenberg opted not to put in one last lap and was demoted to eleventh – and out of qualifying – when Grosjean took the last Q3 spot. The Force India driver has a three-place grid penalty from his crash with Massa last weekend and so will drop to fourteenth as a result. Carlos Sainz clocked twelfth ahead of Maldonado, with Alonso in fourteenth but only 0.5s off the cut-off mark. Although ten drivers were left to battle for pole position, realistically only two were in the fight. Rosberg was the first to set a timed lap in the session and clocked a 1.32.584 while Hamilton set a lap 0.076s behind the other Mercedes, although this was on a lap where he locked his brakes at the hairpin, suggesting he could overthrow Rosberg for pole. Behind them, Bottas provisionally clasped third ahead of Vettel, Massa, Raikkonen, Ricciardo and Grosjean. But as the drivers returned to the track for the final laps, Kvyat touched the grass on the entrance to the chicane and lost control of the car, spinning into the barrier which sent him sideways across the gravel and rolling the car. The Russian’s RB11 was utterly destroyed in the impact which will neccesitate a full rebuild, and as a result he will start the race from the pitlane. The red flag spurred by the crash came with only 36 seconds on the clock meaning there would not be enough time to set another lap and so qualifying was ended. Rosberg took pole as a result, with Hamilton rueing his lock-up which potentially cost him pole and Bottas taking third for Williams. Vettel took fourth for Ferrari, with former Ferrari man Massa ahead of the other Scuderia car, piloted by Raikkonen. Ricciardo took seventh ahead of eighth-placed Grosjean, while neither Sergio Perez nor Daniil Kvyat could set a time before the red flag, leaving them ninth and tenth. Mercedes showed that they appear to have retaken their stronghold over the rest of the field when they clocked the two fastest laps of FP3, over half-a-second clear of their closest rival. It was Nico Rosberg who had the run on his team-mate when teams finally got a chance to complete some dry-weather practice before Sunday’s Grand Prix. The German was the only man to break into the 1m 33’s while Hamilton set a lap over two-tenths slower. Red Bull’s Daniel Ricciardo was the best of the rest as he led the Williams duo of Valtteri Bottas and Felipe Massa. Bottas had sat out the rain-affected FP2 knowing the rest of the weekend would be dry, and appears to have suffered no disadvantage in return. The Ferrari drivers were sixth and eighth, with last-time race winner Vettel 1.2s shy of the Mercedes drivers. Verstappen took seventh for Toro Rosso while Grosjean taking ninth and Sainz rounding out the top ten – the latter completing the most laps of anyone this morning. Nico Hulkenberg in eleventh led an extremely close group of drivers where only four-tenths of a second separated eleventh to seventeenth. Button, in twelfth, looked strong at his engine supplier’s home race, but the Briton missed out on any low-fuel running as the team rebuilt a broken floor on the McLaren. Ericsson was thirteenth for Sauber while FP2 leader Daniil Kvyat couldn’t better fourteenth. Pastor Maldonado brought his Lotus to fifteenth ahead of Fernando Alonso and Sergio Perez for McLaren and Force India respectively. Felipe Nasr finished eighteenth while the Marussia drivers of Will Stevens and Alexander Rossi took their usual spots at the back of the grid for Marussia. Mercedes look to have stood back up and dusted themselves off after being trampled on in Singapore. Although still leading the Championship by 41 points, Hamilton will be keen to exert his dominance and return to the top of the podium. The question of qualifying therefore is can Rosberg beat Hamilton to the front of the grid? Image courtesy of Mercedes F1 Team. Red Bull’s Daniil Kvyat stayed ahead of the Mercedes duo when he clocked the fastest lap of the second practice session ahead of the Japanese Grand Prix. Kvyat had recorded the second fastest time in the morning’s opening session when Toro Rosso rookie Carlos Sainz had topped the time sheets, with the Mercedes drivers of Rosberg and Hamilton taking third and fifth. After their surprise lack of speed at last weekend’s Singapore Grand Prix, all eyes were on the Silver Arrows to see if, as Vettel had predicted, they could bounce back to their usual dominance. Indeed, Rosberg was only 0.023s shy of Kvyat’s time, yet Championship leader Hamilton was over half a second behind his team-mate. Daniel Ricciardo sandwiched the Mercedes men with a time good enough for fourth, while the Ferrari duo of Sebastian Vettel and Kimi Raikkonen, and the Toro Rosso pairing of Carlos Sainz and Max Verstappen slotted into fifth, sixth, seventh and eighth respectively. Verstappen’s running was delayed as the team searched for a lost bolt on the rookie’s car, and thus completed the least laps of any running driver – 5. Felipe Nasr clocked ninth, almost a full second ahead of Lotus’ Pastor Maldonado who rounded out the top ten. Fernando Alonso had a delayed running when his car was reassembled by the team, meaning he came out during the heaviest rain period which left him down the order in 17th. His team-mate drove a time good enough for twelfth while Romain Grosjean – whose ties with Haas are getting stronger as the week progresses – settled in for fifteenth. Felipe Massa was twentieth for Williams, while team-mate Bottas chose not to participate and so did not complete a lap. The Manor drivers of Will Stevens and Alexander Rossi, the latter celebrating his 24th birthday today, filled out the final places on the time sheets. Although Kvyat has outpaced both Mercedes drivers so far this weekend, and Rosberg has kept far ahead of team-mate Hamilton, the fact that the rest of the weekend will be dry means realistically we can’t predict who’ll take pole on Saturday afternoon. Tomorrow morning’s FP3 session, when the teams trial the dry tyres and prepare for Qualifying, will give us a much better idea of how the grid may take shape. Toro Rosso rookie Carlos Sainz was the fastest man during Friday morning’s practice session for the Japanese Grand Prix, marking the first time the Spaniard has topped a session. The unexpected speed in extremely wet conditions saw him clock a fastest lap over half a second clear of second quickest Daniil Kvyat in the sister Red Bull car. With Mercedes’ surprise lack of pace at last weekend’s Singapore Grand Prix fresh in their heads, Rosberg and Hamilton recorded third and fifth respectively, with Ferrari’s meddler and Championship contender Sebastian Vettel wedging his way into fourth. The torrential rain saw limited running from those who ventured on track, with eight drivers – including Daniel Ricciardo, Fernando Alonso and Lotus reserve driver Jolyon Palmer – deciding to stay in the shelter of their garages. Max Verstappen brought the other Toro Rosso to sixth, over 1.5s shy of team-mate Sainz’s session-topping time. Kimi Raikkonen took the second Ferrari to seventh while Williams’ Felipe Massa and Valtteri Bottas coasted to eighth and tenth, and Sauber’s Marcus Ericsson and Felipe Nasr placed ninth and eleventh. The slowest driver to clock a lap was McLaren’s Jenson Button with a lap over six seconds slower than that of Sainz’s effort. The order of practice cannot give too much scope to how Qualifying might play out. The conditions were far too heavy to even set a time for most of the session, and the latter part of the running saw drivers tip-toe the circuit for fear of losing control – and valuable parts on the car. Bottas, for example, went off at the ultra-fast 130R corner while Felipe Massa skipped through the gravel earlier in the lap. Sebastian Vettel predicted this week that Mercedes would return to their strong hold over the grid this weekend, but judging from the times he seems to be holding them honest. With a dry qualifying and race predicted, the major players’ pace is still to be seen. 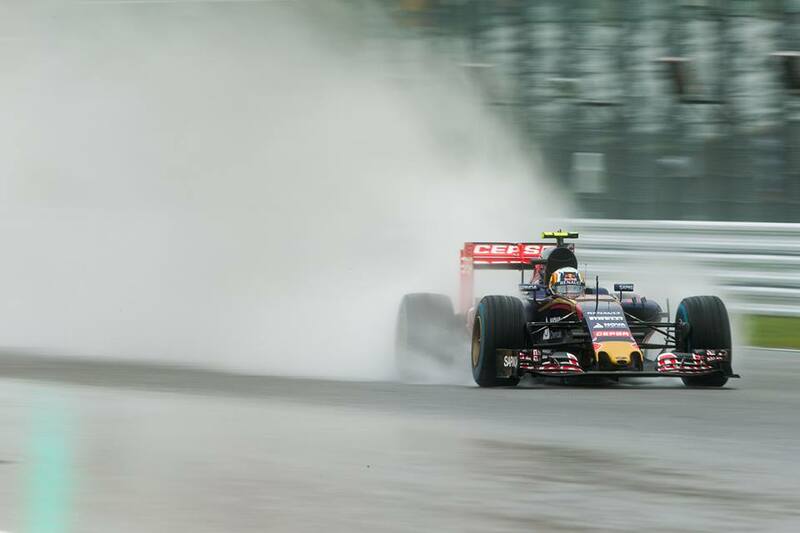 Image courtesy of Scuderia Toro Rosso/Getty Images. 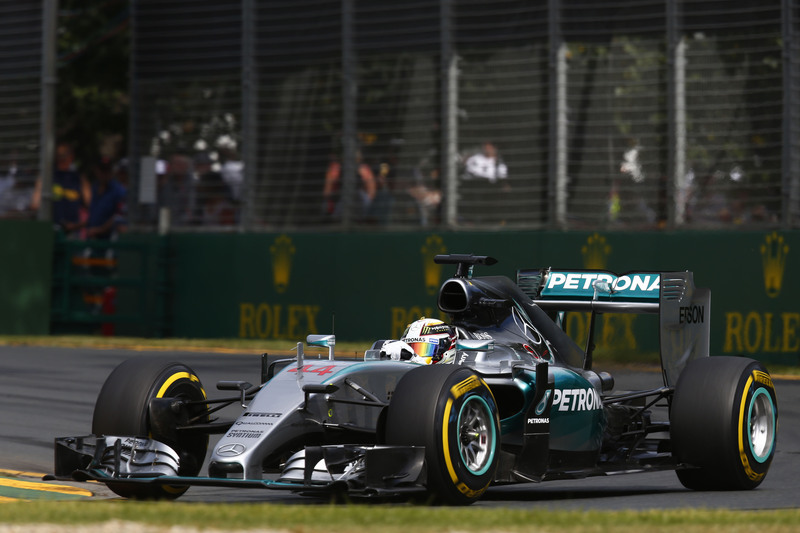 Lewis Hamilton began his title defence by claiming his second victory at Albert Park, keeping team-mate Nico Rosberg at arms length from the beginning. The reigning Champion faced intermittent challenges from Rosberg slipping within a second or two of the sister Mercedes car, but realistically held complete control over the Grand Prix from pole to flag. While the Mercedes duo cruised predictably up front, the grid behind them was anything but predictable. The Manor drivers had failed to make Qualifying as their team struggled to reinstall software to the cars for the new season, meaning Will Stevens and Roberto Merhi will have to wait until at least Malaysia before turning a wheel in anger. Kevin Magnussen was one of three other drivers who failed to start the race: the Dane, who was drafted in to replace the injured Fernando Alonso, saw his Honda engine give up on his lap from the pits to the grid pre-race. Red Bull’s Daniil Kvyat also ended his race effort on his lap to the grid when a terminal problem with his gearbox was discovered. Williams’ Valtteri Bottas failed to even take his car from the garage today, as he was not given medical permission to race. The Finn injured the small of his back yesterday in Qualifying and failed one of the aspects of the mandatory extraction tests earlier today, meaning he will have to wait until Malaysia to begin his season proper. These five absences left only fifteen cars on the grid for the race start, but the car number soon dropped to thirteen. Pastor Maldonado was the innocent victim of a jab from Felipe Nasr which sent him into the barriers at turn 2 and deployed the Safety Car. Meanwhile, his Lotus team-mate Romain Grosjean suffered a technical fault which sent him out of the race, compounding a dismal weekend for Lotus. With Maldonado’s stricken Lotus cleared, the Safety Car pitted and Hamilton led the drivers away for the first full racing lap of 2015. Nico Rosberg stuck close to the rear wing of the sister Mercedes, but third placed Felipe Massa soon lost sight of the Silver Arrows, such is the advantage the World Champions hold. Further down the grid, the eleven other drivers had grouped together into individual battles spaced out along the track. Daniel Ricciardo spent time in front of his home crowd trying to keep Kimi Raikkonen’s slightly damaged prancing horse behind him. Further behind, Sergio Perez and Jenson Button were scrapping for the final places when the Mexican botched an overtake on his former team-mate and spun at turn 3. The battle for third between Massa and Vettel was going well for the Brazilian until he pitted first and allowed Vettel to stay out in open air for several laps, while Felipe met traffic in the much slower RB11 of Daniel Ricciardo. When Vettel emerged from the pit lane a few laps later, he had promoted himself to third and held a cushion over the Williams. Toro Rosso rookie Max Verstappen was doing a good effort of making up for the mistake he made in Qualifying which saw him start twelfth, and he stayed on track on his first set of tyres until lap 33 of 58. When the 17-year-old came out of the pits, however, a puff of smoke acted as a precursor for a full engine failure at Turn 15 a minute later. The heartbroken Dutchman clambered from his cockpit and lamented his bad luck as his former F1 racer father, Jos Verstappen, stormed out of the Toro Rosso garage. Verstappen’s retirement reduced the number of cars to twelve, but when Kimi Raikkonen’s left-rear tyre came loose after a pit stop four laps later, the Finn was forced to pull over at turn 4 and stomp back to the paddock. As Ferrari Team Principal Maurizio Arrivabene grilled the pit crew as to why the car left the pits without the wheel properly attached, the stewards announced that the unsafe release will be investigated after the race. Raikkonen can expect a ten-place grid penalty for the Malaysian Grand Prix, as is the standard penalty for an infringement of this type. With the racing drivers now limited to eleven, only Carlos Sainz and Marcus Ericsson gave commentators something to talk about as the latter caught and passed the former in the final laps. 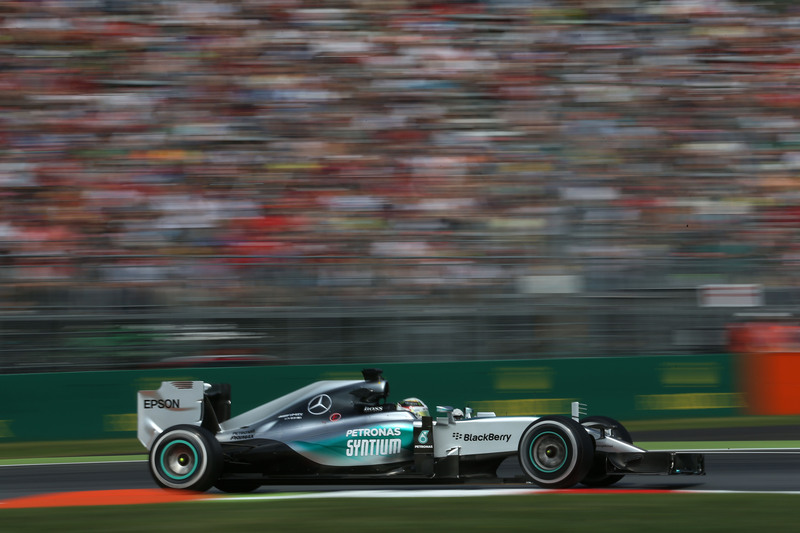 Up front though, Hamilton was untouched as he led Rosberg across the line for his 34th victory. Sebastian Vettel crossed the line to take a podium finish on his debut with Ferrari, while Felipe Massa shadowed the Scuderia over the line. Felipe Nasr finished fifth on his Formula One debut – the highest result for a Brazilian driver in his first F1 race. Daniel Ricciardo finished sixth ahead of Nico Hulkenberg, while Marcus Ericsson scored six points from finishing seventh – meaning Sauber take fourteen points home from the Grand Prix. Having gone scoreless in 2014, this will certainly not go uncelebrated. Carlos Sainz joined Felipe Nasr as a rookie scoring a point on his debut, when the Spaniard finished ninth for Toro Rosso. Sergio Perez was the final points finisher for Force India, while Jenson Button finished dead-last and was the only man to cross the line without scoring a point.